Happy St. Patrick’s Day from Catching Up On Cinema! 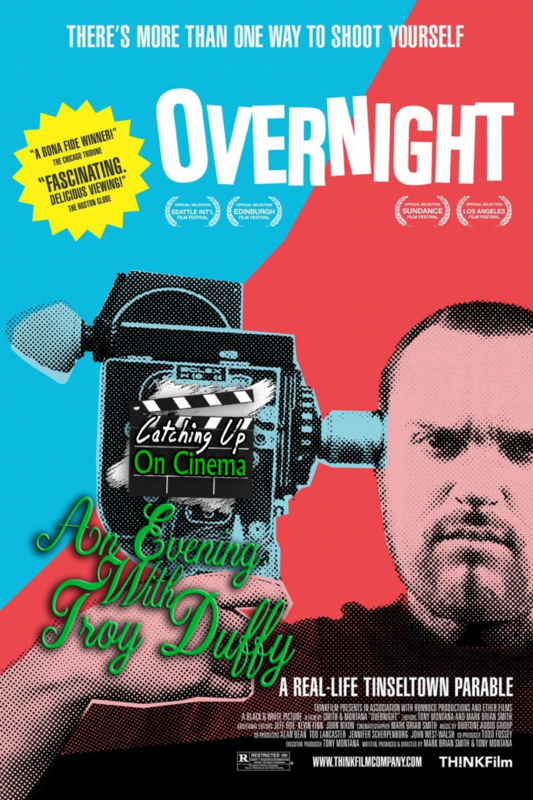 In keeping with the Irish-ish theme we’ve had for all the episodes posted this month, Kyle and Trevor invite you, the listener to join them in a special 3-part event we’ve taken to calling “An Evening with Troy Duffy”. For the uninitiated, Troy Duffy is of course the borderline talented Irish-American bartender/bouncer/screenwriter who is best known for writing and directing The Boondock Saints (1999). Once thought (for about 5 minutes) to be the next big thing in Hollywood, Mr. Duffy would go on to become the subject of a cautionary tale of sorts, one that is detailed in the documentary we’ll be covering in today’s episode, Overnight (2003). Look forward to follow-up episodes on both The Boondock Saints (1999) and The Boondock Saints 2: All Saint’s Day (2009) AKA the entirety of Troy Duffy’s theatrical filmography!